With the iPhone 7 Plus, Apple launched its first ever dual-camera smartphone in the market. Dual camera systems have certain advantages over single camera shooters, which enables them to take better, more DSLR-like photos. The iPhone 7 Plus also has certain camera features, which are not inherently available on the iPhone 7. On the iPhone 7 Plus, you can get up to 2X Optical zoom and up to 10X digital zoom. It also enables users to easily take photos in Portrait Mode having the Depth-Of-Field (DOF) effect, in which the subject of the photo is in focus while the rest of the background is blurred out. 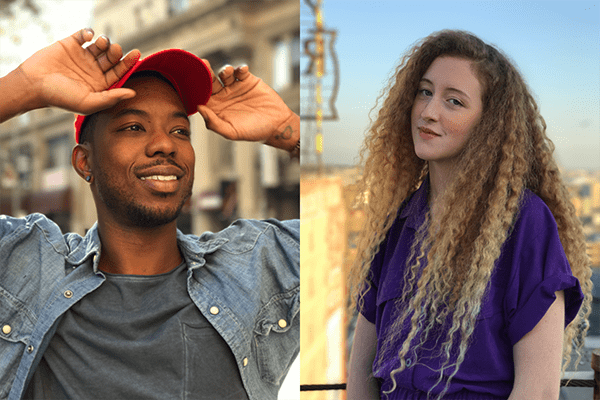 The Portrait Mode is also able to create something professional photographers call the “bokeh” effect, which refers to the aesthetic quality of point-of-light objects in a photograph’s background. All these effects are automatically rendered by the smartphone, allowing the user to take high quality DSLR-like shots quite easily. So how does the iPhone 7 Plus achieve this, whereas the iPhone 7 can’t? The iPhone 7 has a single f/1.8 aperture 12 MP shooter, whereas iPhone 7 Plus has a f/2.8 aperture 12 MP telephoto camera in addition to the wide-angle f/1.8 aperture 12 MP one. The dual-cameras on the iPhone 7 Plus allow up to 2X optical zoom and enable the smartphone to automatically create a depth map of the scene being shot. Once the depth map has been established, the rest of the effects (i.e., the blurring of background and bokeh effect) are rendered by the Camera software. So, the only significant advantage of iPhone 7 Plus over other iPhone models, required to take Portrait Mode photos, is the ability to create depth maps using the dual camera setup. If we could manually define foreground and background areas in a particular photo, the bokeh and blur effects can be rendered even on the iPhone 7 (or any other iPhone with a single camera setup), using third party apps. There are, in fact, third party apps available on the App Store, that allows you to either define the background and foreground manually, or identify layers automatically using other techniques such as facial recognition. 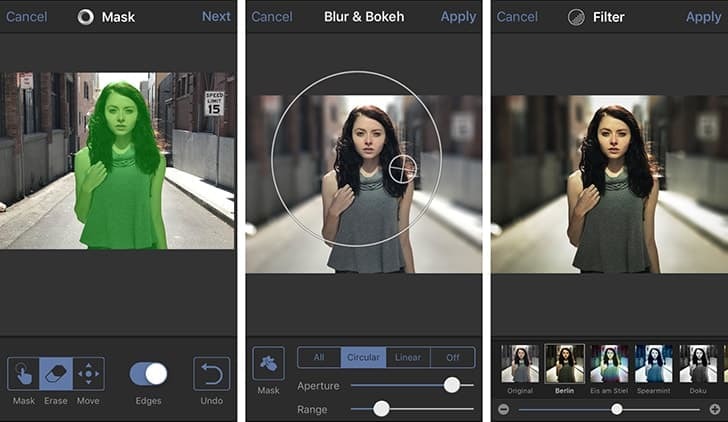 These apps help create DSLR-like photographs by implementing blurred background and bokeh effect in regular photos taken with single-camera iPhones. In this article, we’ll explore a few of these apps. FabFocus is an excellent app to get Portrait Mode-like Depth-Of-Field photos and bokeh effects on your iPhone. Using its advanced human body recognition algorithms, FabFocus can detect faces and human profiles in photos, and is able to blur out the rest of the image as background. The app additionally provides a tool for manual selection of the foreground, but the process requires very steady fingers for accurate selection of areas. The app also provides options for defining the shape of bokeh and the amount of blur. A number of built-in photo filters are also included. FabFocus is available on the App Store for $1.99. The foreground map created by FabFocus is greatly dependent on profile and face identification. If the subject’s face isn’t facing the camera, FabFocus may not be able to select foreground areas correctly. Also, if the subject in focus isn’t a human profile, the app’s automatic selection mode is not much of a help. In these cases, the user has to switch to manual area selection, which is tedious and prone to human error. In other words, your photos won’t get the desired end result. Tadaa SLR differs from FabFocus in the fact that it gives you greater control when editing photos. Unlike FabFocus, it doesn’t use any algorithm to mark foreground and background areas. Rather, it leaves the selection of areas entirely to the user. However, selection of areas does become easier when you turn on the Edges option. This is an equivalent of the Magic Selection tool of Photoshop where areas get automatically selected based on the color composition. Once the area selection is done, the rest of the photo can be blurred out, thus creating a Portrait Mode-like effect. Apart from manual selection of areas, you can also select focus and blur areas based on a number of presets, such as Linear or Circular. Similar to FabFocus, Tadaa SLR also supports photo filters and other photo editing options. The app helps you create remarkable Portrait Mode shots, irrespective of the type of objects you want to put in focus. Tadaa SLR is available on the App Store for $3.99. It’s a bit pricey, but it’s a lot less you have to pay if you consider buying an iPhone 7 Plus only for Portrait Mode shots. So, which app are you going to use? That depends solely on your preference. If you take a lot of selfies and profile shots, and you want to save yourself some time and effort from manual selection of focus and non-focus areas, FabFocus can be an excellent choice. But if you want more control over the selection of foreground and background areas in photos, and don’t mind a bit of manual work, Tadaa SLR can give you great results! Let us know what you think of FabFocus and Tadaa SLR in the comments below.